It’s been a long, cold, winter and we all know that you and your sofa are now better buddies than ever. But spring is coming and you’re going to want to get outside and be active. While it’s tempting to try to go straight into super-hero mode, it’s not very smart. Strained muscles, or at least sore muscles, are no laughing matter. So, where are some places to go where the fun is plentiful, but the workout is manageable? There are lots of options on Whidbey and Camano Islands. We offer up four hikes, walks really, that can be a great first “step” into getting back in shape. seen from the Bluff Trail on Ebey's Reserve. WHERE ARE OUR FOUR HIKES? 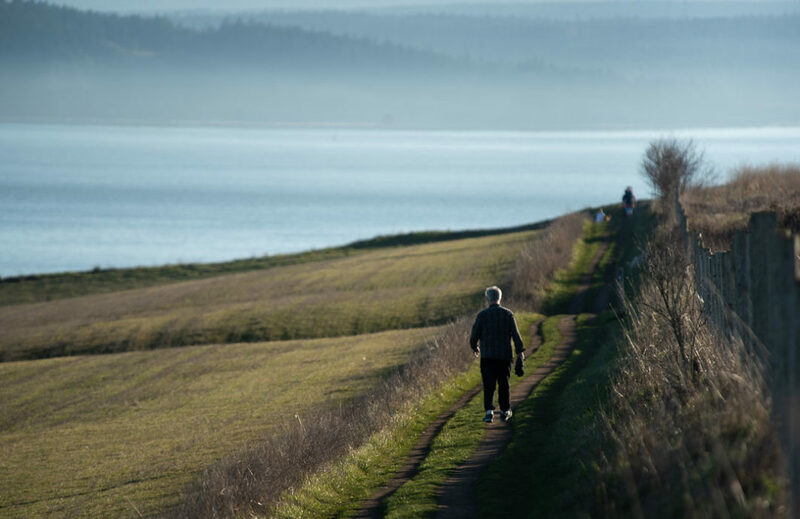 No, we’re not talking about the super popular trail up the bluff from Ebey’s Landing. That’s a beautiful trail, but it’s not really the kind of trail for a first walk. Instead, there’s another reasonably flat trail that runs about three-quarters of a mile and intersects with that steep bluff trail about half-way up. To get to the Ebey’s Prairie Ridge Trail, drive to the Sunnyside Cemetery on Ebey’s Reserve. Drive around to the west side of the cemetery to the trailhead parking lot. Walk west towards the historic Jacob Ebey House and follow the trail around until it starts following a fence heading towards the water. The views of Ebey’s Reserve are beautiful. You can enjoy the view overlooking Ebey’s landing, then turn around and head back. This is a triple-secret double-probation “need to know” special place for solitude. 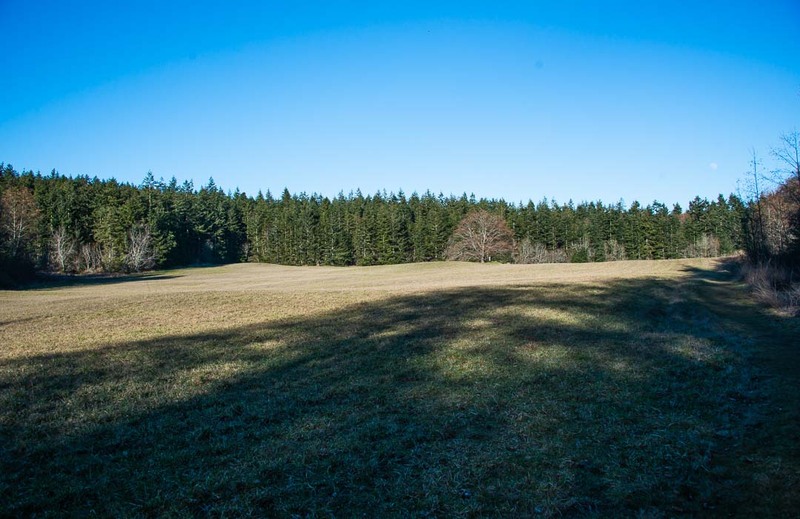 Located about 15 minutes from downtown Oak Harbor, this meadow is a great place for a long walk, and you’ll feel like you’re the only person in the world! Park at the small lot at the corner of Zylstra and Fawndrop and look for a locked gate. There is a narrow opening to the left of the gate that is wide enough for people. For the first part of the hike, you’ll be walking through the woods. Even in the mid-day of summer this part of the trail is usually in shade. In the spring, watch for slick spots. After about three-tenths of a mile, the trail opens into this amazing, large meadow. You can head right or left, it doesn’t matter. The trail makes a loop around the meadow’s perimeter, returning you to where you began. The loop runs about .6 miles and is almost entirely in the sun, so be sure to bring sunscreen and water. Even if the weather isn’t perfect, you can still have a great hiking experience. Read how an impulse hike in winter turned out. What’s a walk on an island without a walk on the beach? And, the beach stretching east from the Coupeville Ferry Terminal is a great place for spectacular views and also for bird watching. 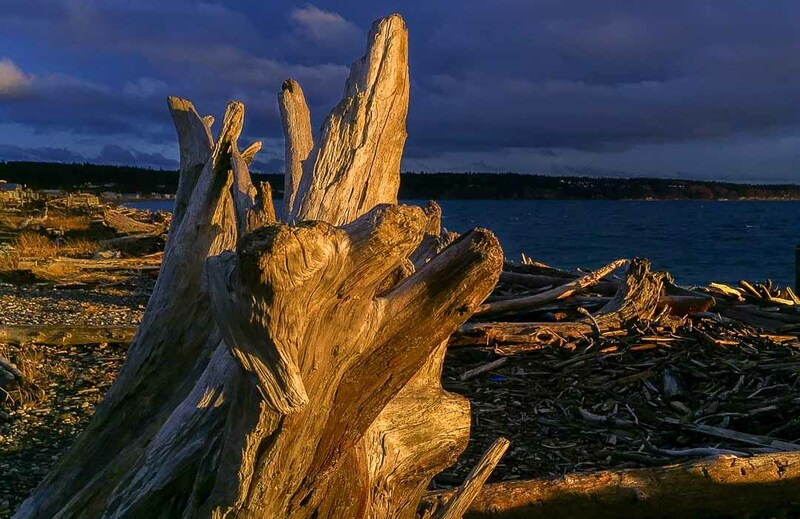 The park is named Driftwood Park for a reason, the entire area is a prime spot for marine debris to wash up, so step carefully until you’re past the driftwood. The 1.5 miles west of the small park (3/4 of an acre) is state land so you’re good to go. Just stop before reaching private property. The state land also has parking, but you’ll need your Discover Pass. Across the highway is Crockett Lake, a particularly good spot for watching birds. There is no trail around the lake so confine your bird watching to places like the bird observation platform on the ocean side of the highway. On the east side of Camano Island is the trail through Iverson Spit Preserve. Another bird- watching favorite, the preserve offers a loop trail that runs for about a mile. There’s a viewing platform as well. The trail runs along a dike and there are several benches. A portion of the return trail loops through a grove of trees and is named the “Hobbit Trail.” We saw no hobbits, but maybe we were looking at the wrong time. Come early in the morning to hear the birds at full volume.